Editors: Dennis, Mark R., Glendinning, Paul and Martin, Paul A. This is the most authoritative and accessible single-volume reference book on applied mathematics. 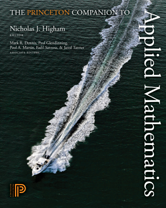 Featuring numerous entries by leading experts and organized thematically, it introduces readers to applied mathematics and its uses; explains key concepts; describes important equations, laws, and functions; looks at exciting areas of research; covers modeling and simulation; explores areas of application; and more. I.1 What Is Applied Mathematics?